It is the aim of BWMS to convey a very positive community nature conservation message that snakes should NOT be viewed as an animal that needs to be killed on site but an animal that can be viewed as part of the local ecology. Within Brisbane and South-east Australia snakes may be present in domestic yards to development sites. In instances where a snake is determined to be a threat to personal welfare and safety, the snake can be relocated by a permitted snake catcher to an appropriate habitat. It is ESSENTIAL not to handle any snake that is unfamiliar as one bite can be fatal, if not, result in long term rehabilitation. Vegetation density and landscape attributes is a key facet in determining potential snake habitat and useage. Highly venomous snakes do exist within S.E. 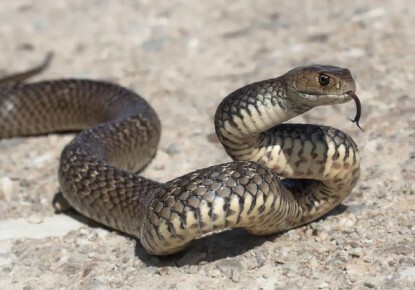 Queensland and are relatively common, including the Eastern Brown snake (highly venomous). It is the role of a snake catcher to identify, capture and relocate a snake located on site. Carpet pythons (non-venomous) and are also common within this region, as with all snakes Carpet python's should be viewed as an ecological stabilizer or advantageous, to the extent, a favored food source is rats and mice in urban environs. Accidents have occurred due to people handling snakes, dead snakes included, due to an involuntary central nervous reflex response of the snake. People have been injured due to an incorrect identification and subsequent handling of a venomous snake, thought to be a non-venomous snake. It is vital to understand that a snake's coloration is not categorical and is viewed by professional snake catcher's as a poor characterization tool; coloration can be dependent on genetics, habitat and locations. Looking for a Snake Catcher in Brisbane?